July Bloom Box Blog Hop – Mermaid Kisses – Welcome! 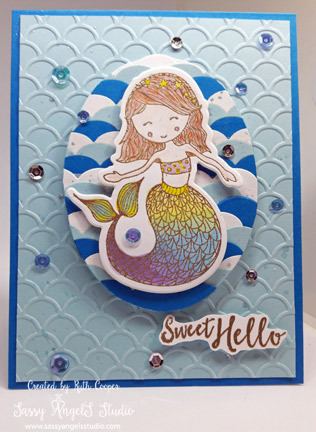 Welcome back for blog hop #2 featuring Mermaid Kisses, the Fun Stampers Journey Bloom Box for July. If you arrived here from Crissy’s blog, then you are right on track, if not just keep hopping until you come full circle. This blog hop will showcase some additional projects you can make with this month’s Bloom Box. I had a lot of fun creating today’s card. Isn’t she fabulous? I built the oval first by layering scallops in Whip Cream, Pool Play & Beach Ball and attaching them to the large Journey Oval die cut, then trimming to shape. I embossed the background layer using the new Layered Scallops embossing folder. I then took some Sparkle Silk, added a bit of Turbo Teal silk for a hint of color & added some splash & sparkle to the embossed layer & oval. My little mermaid is Gold embossed & water colored with the Color Splash pencils. I used the Color Burst pencils on her skin & hair. The sentiment is also Gold embossed. A few sequins & some foam squares to pop up the elements & this beauty is finished & ready to brighten someone’s day. Starting with the July Bloom Box, FSJ made some changes to how you can purchase the Bloom Box. You can still subscribe for 6 months & receive great projects on your doorstep for just $24.95 per month plus shipping/tax. Or you can now purchase the Bloom Box ala cart for $29.95 per month plus shipping/tax for just the months you wish to purchase. Ala cart purchases are until supplies run out, so if it’s a popular set, you could miss out. Bloom Boxes will no longer be available after the month they are released unless there are still some in stock, once they are gone, they’re gone. Thank-you visiting my blog. Be sure to hop on over & check out Kristina’s great project. Have a wonderfully creative week & share a smile with someone! I love this card! You did a BEAUTIFUL job creating the scalloped backgrounds and the color combination is fabulous! Stunning card! Love the embossing, your mermaid, it’s just beautiful! Great job!